When covering an industry, any industry, it’s easy to get jaded; and tabletop gaming is no exception. We live in a world where products are being created ad nauseum, where games are designed around never-ending expansion cycles and where crucial development time is cut to get the game to the masses as soon as possible. And most of us are more than happy to fork cash over the hype monster for games that we don’t even know if we’ll like because of a name on the box, a recognizable title, a reliable publisher, or we just love how the box looks. Some time ago on this year’s Tabletop Day, the innocent, baby-faced Barenpark was placed in front of me with little ceremony, pomp, or circumstance. Looking at the box art, I couldn’t help but feel the familiar acidic taste of cynicism boil in my throat as I waited for what was surely a looser version of Patchwork, shoehorned to fit 4 players, with some cute bears plastered on the components. And you know what? I was right. That’s exactly what I got. And I love it. Even if the storage solution is a bit atrocious. Barenpark couldn’t be a simpler affair, bringing about a tone of ease and relaxation (aside from the occasional curse uttered when you get skunked out of the tile you need). Each turn, you place a tile you’ve collected on a previous turn on your board adjacent to tiles you’ve already built. These tiles will cover various symbols that, you guessed it, earn you more tiles to place on future turns. Green wheelbarrows get your generic green park tiles, allowing you to fill gaps easily and better maneuver through your park layout. White cement trucks let you grab one of the four types of bear sanctuaries, earning you more points the earlier you draw them. Orange dump trucks earn you the rare specialty tiles, each of which is entirely unique and features strange and interesting patterns. And finally, construction workers will get you an additional plot of land to connect to your park, which will grow to be four tiles large. One symbol, however, cannot be covered; the dreaded manholes. These sit in the middle of your boards, taunting you, laughing maniacally as you attempt to shift your plans around them; small wrenches thrown in your otherwise meticulous machinations. Luckily, these do serve an important purpose; once you fill in a section of your board fully (other than the aforementioned manhole), that spot will be filled in by a high-scoring, glorious bear statue. Similar to the white tiles, the earlier you grab one of these, the more you earn, making long-term planning a constant necessity. The only other thing to consider is achievements; each game will feature 3 randomly selected scoring options from a pool of 10, providing players will a few more ways to pull ahead of the competition. Parameters include being the first to have 3 bears of a given type in your park, making a continuous water feature throughout your park, or building 2 bear statues in the same turn. For the jaded gamer, a thousand words might come to your (my) snooty mind when taking first glance at this game; shallow, trite, uninteresting... The art is nothing special, though there is a certain charm to the child-like sketches the adorn the central board and the bears meandering through their tiles. The components are sturdy and feel good in hand, but there’s nothing overtly new or exciting about them. For a modern game, there are no embellishments here; this is as bear-bones as it gets. These piles of tiles won’t last long. Yet in this way, Barenpark is a comforting, familiar experience. It does little to hide what it is because it clearly knows what it wants to be and succeeds on every level. Each time I pull this out, I know to expect a light, relaxing time building my little park with a few friends, hoping I can eke out just a few more points to stretch ahead of the competition. Other than the occasion inflammatory cry, much of your time spent with this game will be calm and contemplative as everyone works to consider their next 2 or 3 turns. Now, I mentioned earlier that in a narrow view, Patchwork can be seen as the superior game; it has tighter mechanics, presents many of the same tile-laying concepts at work here, and works to keep an ever-present tension throughout the experience. But you know what it doesn’t have? Bears. Tons of cute little bears and even some non-bears (namely Koalas). If you put a cute little bear cub and a quilt in front of me, I’m sorry, I’m cubbing it up all day. And you know what else Barenpark has? The ability to play with 4 players. Sure, having a smart 2-player experience is good to have in your collection, but Barenpark is still quite fun at the 2-player mark and is just as enjoyable if not more so at 3 and 4, a flexibility that can go a long way. Game nights don’t often have room for 2-player endeavors, meaning that, particularly in my collection, exclusively 2-player games are rare due to how infrequently they get played. 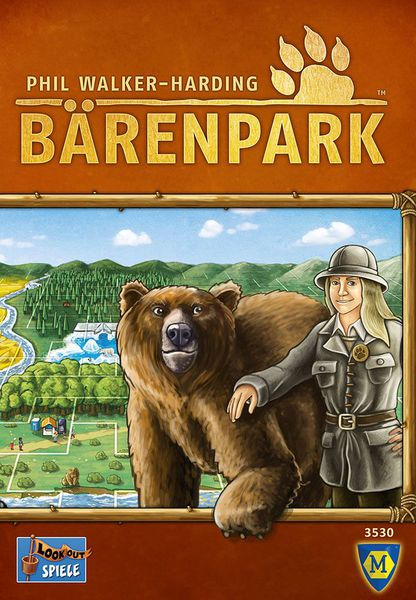 Barenpark both solves that problem and provides that 2-player experience, even if it’s slightly subpar in comparison. I’ve been meaning to track a copy of this game down for the last year, and I am so glad I finally got my hands on one. Barenpark is one of those games I can always return to without fail, knowing just what to expect with little deviation or surprises from a genuinely quaint, fun time. It’s great to start out or end a game night or to cuddle up on the carpet with your significant other to play at 1 in the morning. It has a theme that appeals to everyone, a puzzle quickly grasped, and a lighthearted tone that takes a lot of the pressure out of the competition. To me, I imagine this title will always have a place in my collection. Who Should Get This Game: Anyone who doesn’t need brand new ideas to have a good time, finding pleasure in simplicity and a fun puzzle. Who Shouldn’t Get This Game: If you’re looking for the next big game-changer or hate bears, you can pass this one by.